Emily Jiang is joining us today with her picture book Summoning the Phoenix. Here’s the publisher’s description. Every musician knows that learning to play an instrument has its challenges and its rewards. There’s the embarrassing first day of rehearsal, but also the joy of making friends in the orchestra. There’s dealing with slippery concert dress, or simply getting swept up in the music. The twelve children in this book are just like any other musicians practicing their instruments and preparing for a concert. But what sets these music lovers apart is that they all play traditional Chinese musical instruments in a Chinese orchestra. Including both flights of fancy and practical considerations, lively poems capture each child’s musical experience with a different Chinese instrument, while sidebars provide more information about each one. Vivid illustrations depicting each fascinating instrument bring you along on this musical journey. And then you are invited to the grand finale! One of the great joys of being a picture book author is seeing the artwork inspired by my words. 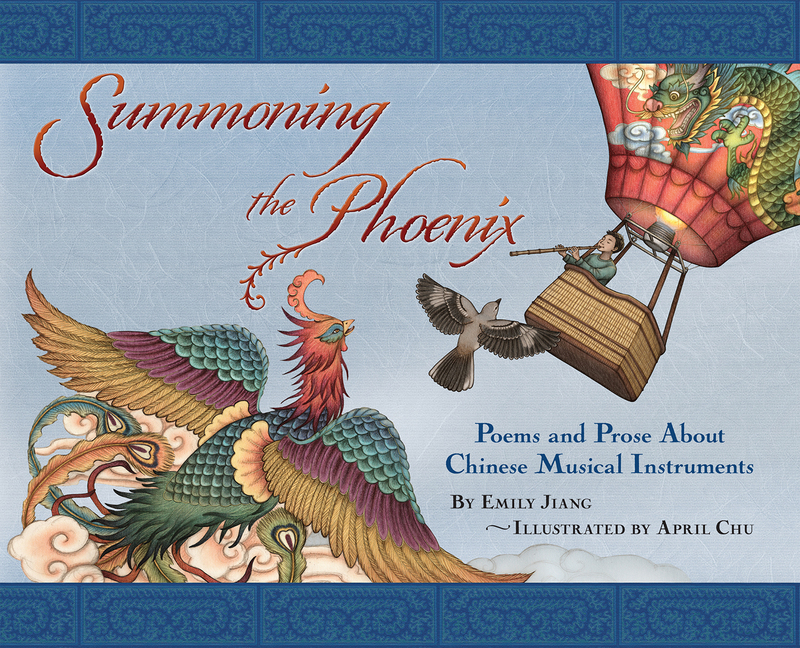 I’m so grateful that the amazing April Chu agreed to illustrate my first picture book Summoning the Phoenix: Poems & Prose about Chinese Musical Instruments. April is an artist and professional architect, and I admire her whimsical aesthetic, her attention to detail, and her ability to realistically illustrate pretty much anything, including the mythical phoenix. With April’s permission, I’d like to share her gorgeous artwork that inspired the title of my book Summoning the Phoenix. But first, let me share the companion poem “Magical Melody” in its original format. This poem is a simple list poem, which is great for children. I specifically chose to format the poem with careful indentations and line breaks to evoke the shape of a bird’s wing on the page. When I wrote “Magical Melody,” I kept in mind the Chinese myth about a man who could play a xiao, a long bamboo flute, so beautifully that he could control clouds and summon phoenixes. Yet at the same time, I was aware I was writing a poem spoken by a contemporary American child. While writing this poem, this is what I envisioned. A little girl, maybe about five of six years old, is sitting on her bed, alone in her room. She’s playing the xiao, and one by one, a different bird flies through her open window to land right in front of her bed. The phoenix is the last to arrive, and it’s perched on the open window sill, its fiery wings tucked under as it listens to the magical melody. As a picture book author, I knew not to explain this image in my head to the illustrator because I wanted the illustrator to bring her own personality and imagination to the book. Explanations to the illustrator might work for comic book scripts, but not for picture book manuscripts. When I saw April’s artwork, I was absolutely blown away. surrounded by all the birds in flight (instead of sitting on the floor). I remember staring at amazement at this boldly serene boy playing the xiao in a hot air balloon decorated with a Chinese dragon. The Wizard of Oz has nothing on this kid. Soon after I received the artwork for my book, I showed this illustration to a professional ornithologist and he accurately identified each and every bird, even the phoenix. One of my favorite bits of this favorite image is how April brought in the dragon on the right to balance the phoenix on the left. In traditional Chinese culture, the dragon is a symbol of good luck, not a dastardly monster who kidnaps maidens and kills knights. In China, the dragon and the phoenix are often depicted together, a fact I learned when I was thirteen and touring the Forbidden Palace in Beijing. I remember wondering at so the dragons and phoenixes carved next to the stone steps. The tour guide explained that the dragon is a symbol for the Chinese emperor and the phoenix is a symbol for the Chinese empress. So by pairing these two mystical creatures the the illustration above, April evokes that ancient Chinese tradition. But her clever incorporation of Asian culture doesn’t stop there. If you look at the clouds in the artwork, you might notice that most of them are a pale blue that blends into the sky background. The exception are the clouds underneath the phoenix. Those clouds are drawn in an Asian style and colored a brighter yellow-orange, as if they are the smoke that results from the fire of the phoenix. Note that these Asian-inspired clouds also appear in the balloon right next to the dragon’s head. I could go in more detail about April’s artistic brilliance, how she reserved the large splashes of color for the mystical Chinese animals and designed the artwork to draw the eye from the phoenix to the kid to the dragon, how she cleverly overlapped the birds so that their focus is the empty space in the middle, how the empty space represents the true artist’s soul via negative capability ala Keats, but how really that concept has existed in Chinese culture thousands of years before. Ultimately, I’m thrilled that the artwork is stunningly gorgeous and true to the poem. As an author, my only concern was how was my poem going to fit in that amazing artwork? My editor and book designer discovered a way to fit my words in that small central circle, underneath the owl. 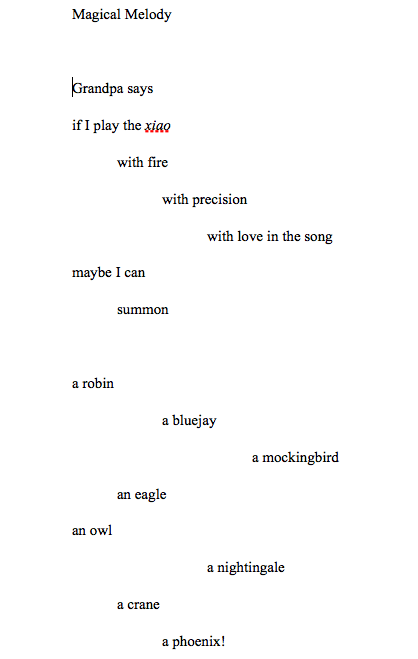 While my poem no longer looks like a bird’s wing, it still preserves the spirit of my poem. But don’t let me be the only judge. What do you think? Emily Jiang is the author of Summoning the Phoenix: Poems & Prose about Chinese Musical Instruments, illustrated by April Chu and published by Shen’s Books, an imprint of Lee & Low Books. Emily holds an MFA in Creative Writing from Saint Mary’s College of California and a BA in English from Rice University. She is also a graduate of the Clarion Writers’ Workshop, the Chautauqua Writers’ Conference, the Napa Valley Writers’ Conference, and the VONA/Voices of Our Nation Workshop. Her fiction has won several awards, including Top Prose Prize in The Binnacle’s Ultra Short Competition the Sue Alexander Award for Most Promising New Manuscript from the Society of Children’s Book Writers and Illustrators. Her writing has been published in Apex Magazine, Stone Telling, Strange Horizons, Goblin Fruit, Interfictions, and The Moment of Change anthology of feminist speculative poetry. She wrestles with words everyday. Sometimes she wins. Other times, it’s a draw. This is like seeing a director’s cut. I love seeing the intent as well as the result. And the result is stunning.